The whole ‘will more customers buy new cars online in future’ question is one which certainly has the industry divided at present (One in five cars could be sold online by 2015). Most car dealers still need to be convinced and most are not in any rush to encourage this kind of buying behaviour. However we have all seen the pace at which many aspects of internet marketing have affected buying behaviour and many dealers will admit that more customers are carrying out all kinds of research before entering into dialogue with a dealer, and when they do it is usually only to discuss how much and how quick. Contributors at MTI, being made up of many current and ex-motor trade professionals, are probably divided along the same lines. The older ones among us believe that the investment from franchised dealers and their manufacturers will dictate the thinking around online sales and believe that ultimately, because of the emotive nature of car buying, the majority of buyers will always want to touch, see, smell and drive before making such a large investment. 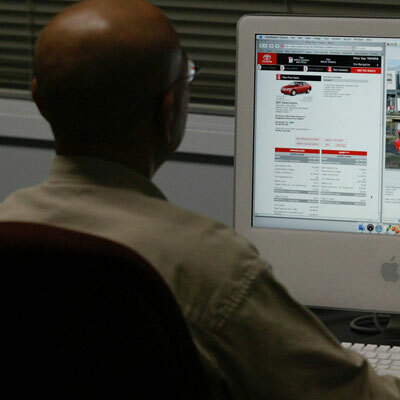 On the other side of the argument are those of us who believe that the next generation of car buyers are confident enough and PC literate enough to trust in the online car reviews and virtual test drives. Add the fact that brand image on some cars is so strong many buyers would feel comfortable just buying on reputation. With internet retail sales already accounting for approximately 10.5% of all UK retail sales, buying online may very well become they way most people spend their money in the years ahead. As a result the thought of buying a “big ticket” item like a car may not be all that daunting to future generations of car buyers. The only downside with the “now” generation is they want their purchase and they want it now! So long lead times may be the only issue. It will probably depend, like most of these things, on getting the balance right and making the experience good enough that online buyers can trust that they are getting what they are paying for and that online retailers can deliver on that service as efficiently as possible. It will certainly cut down on overheads and staff but whether it will make the savings good enough to attract enough buyers to buy online from start to finish remains to be seen. People buying any products today, perhaps more so than ever, want good value for money along with great service, and the old fashioned way of doing things properly will never change. Whilst at my mother’s this weekend she explained to me how she had taken her little Beetle into her local VW garage because a light had mysteriously illuminated on the dashboard. As I braced myself for the bad news about how they charged her a fortune just for looking at it, I was surprised to hear she was thrilled by the service she received. In her words they made her feel relaxed plugged their machine in, checked everything was OK and cancelled the warning light all for the princely sum of nothing. She said she will now always take her car there for all her work because she trusts them and is happy to pay a little more just to have that peace of mind that she is being looked after. A fantastic little piece of PR. In many people’s opinion there will always be a need for human interaction and, most importantly the need to look someone in the eye before completing a deal. Report reveals a buoyant luxury car marketSell the metal! When rip-off Britain was in full flow in the late 1990’s, we had a customer who had imported a new car (UK spec) from Holland. When he suffered a problem, he came to us and we diagnosed a fault which would be put right under the manufacturer warranty. The manufacturer would not provide a courtesy car so he asked if we would supply him a car without charge whilst the work was carried out – when he was told we wouldn’t, he suggested we do so as a goodwill gesture – our advice was to go back to the dealer he bought the car from as we did not owe him any goodwill.